Samsung announces Galaxy Home smart speaker, Spotify partnership | What Hi-Fi? The new smart speaker will run Samsung’s Bixby voice assistant and feature personalised Spotify integration. 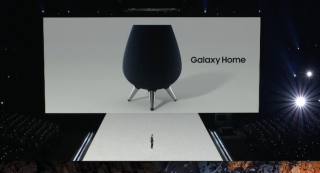 In the moments following the announcement of its new Galaxy Note 9 smartphone at the Galaxy Unpacked event this evening, Samsung also shared a first look at, and first details of, its highly anticipated smart speaker, the Galaxy Home. Sound familiar, Google? Naturally, the Galaxy Home will be powered by Samsung's Bixby voice assistant, meaning it will be able to interact with Samsung’s ecosystem of Bixby-loving products. Predictably, given Samsung's ownership of Harman, the Galaxy Home is the result of AKG engineering. In addition to a subwoofer, six drivers positioned around the spherical speaker (which sits on a tripod stand) offer 360˚ sound, while eight microphones should enable voice commands to be picked up easily from across a room. The speaker will also benefit a new feature called SoundSteer, which allows users to ask Bixby to direct music towards their specific listening position. Samsung didn’t reveal full specs or information on pricing and availability, so we’ll have to wait to find out more. Samsung also announced a partnership with Spotify, which will see users be able to switch music between Samsung devices more easily. For example, if music is playing on a Galaxy Home, one push of a button can see it playing on a Samsung TV instead. Got a second Galaxy Home in another room? You’ll be able to press a button to switch music playback to that speaker, so music can follow you around your house. A Spotify spokesperson at the event said to expect “deeply integrated Spotify experiences on Samsung devices” in the future, with Samsung CEO DJ Koh promising “it’s the start of things to come”.